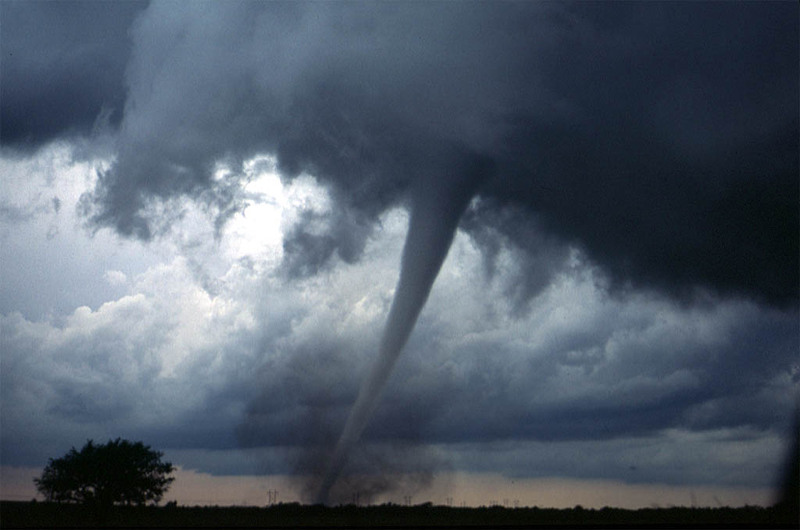 Although sometimes very destructive, tornadoes do not always bear completely bad news. In fact, there is one weather incident that may have changed the course of American history. This event occurred during the war og 1812 and probably included a series of severe thunderstorms, as well as embedded tornadoes. The end result from Nature’s destructive forces may have been responsible for driving the British troops out of our newly formed national capitol, located on the north shore of the Potomac River, just a few miles upstream from George Washington’s plantation in Mt. Vernon, Virginia. Today August 25, 2015 is the 201st anniversary of the tornado that helped save Washington, D.C. from British invasion. To put it mildly, on this date in 1814, the new nation was in dire straits. The new capitol was burning and all naval activity on the Chesapeake Bay was controlled by Her Majestry’s Service. The British troops had arrived the day before and set fire to many buildings, including the White House. The Madison’s were forced to vacate the newly-built property at Pennsylvania Avenue and retreat to nearby Georgetown. On the night of August 25th long term British occupation of the new capitol seemed like a certain thing. That is until a line of thunderstorms, partially fueled by daytime temperatures of 100 degrees Fahrenheit, approached the city. 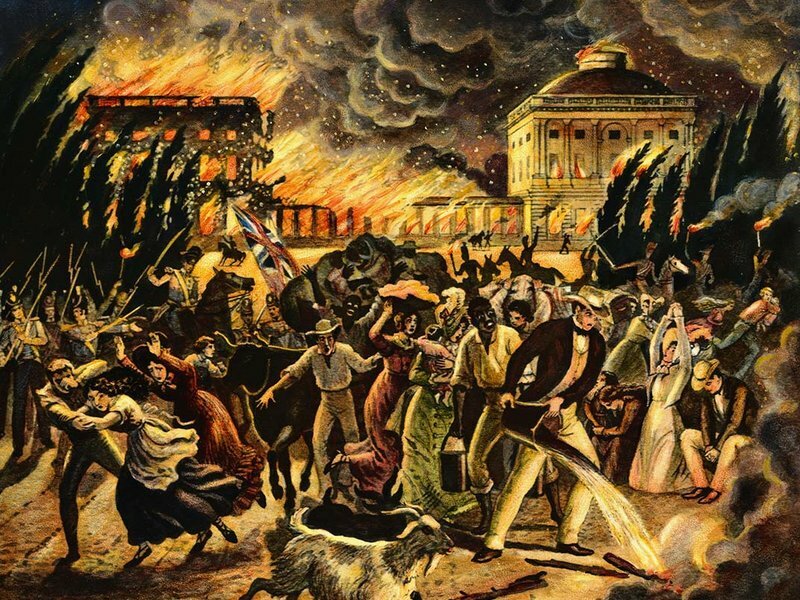 The torrential rain doused many of the fires and one (or more) tornadoes tore through city, uprooting trees and sending British cannons flying through the air. Dozens of British troops were killed in the tempest, mostly by collapsing buildings. The next day, the British forces left the city and the place has not been militarily attacked or occupied since. 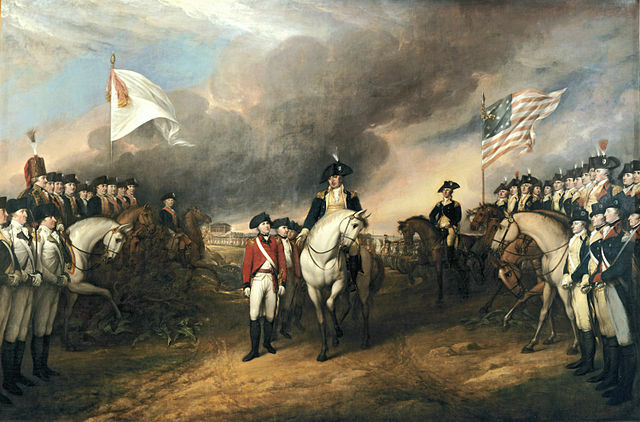 According to many historians, the evacuation of Washington may have figured in the end of hostilities between the two nations (America and Britain) and provided the groundwork for a peaceful settlement that ended the war and re-established a sovereign nationhood for the U.S., Great Britain, including the British territory located to the north (now called Canada). Perhaps, August 25th should be declared National Tornado Day, not only to celebrate the survival of Washington during the War of 1812, but also to acknowledge that there aspects of natural disasters that are beneficial to mankind. Hurricanes bring rain, forest fires help regenerate certain types of forests and tornadoes may possibly aid in the continuation of some grasslands. None of these disasters are man-made and may certain long-term benefits, despite their immediate destructiveness. Fact and fiction are a strange pair of bedfellows. One might think that fictional episodes might provides the strangest stories, but in reality, it is often true episodes that provide the most bizarre tales. When I was in grade school, I acquired a Smother’s Brothers LP, where they did a short sketch on the pilgrims landing at Plymouth Rock. Though short, the routine was hilarious and may have provided a bit of inspiration to this story. Looking at the success that these two brothers had in spoofing America, one can only conclude making fun of our past might lead to some success. Just because you are presenting an alternate history to the mainstream version, does not mean that you can skimp on the little details of everyday life. Things like dress, architecture, mannerisms and even language should fit the times as best you can. This may take some research and in the process you may surprised as to some of the information that you might come across. When writing Colonial Capers, I wanted to use the type of Elizabethan English that might have been used by the Pilgrims. During my inquiry, I found out that by the time of the Revolution, this style of speaking had all but died out, so I dropped all the thees and thous. Nonetheless, I did come across some very colorful Colonial slang that was used in the years just prior to the Revolution. 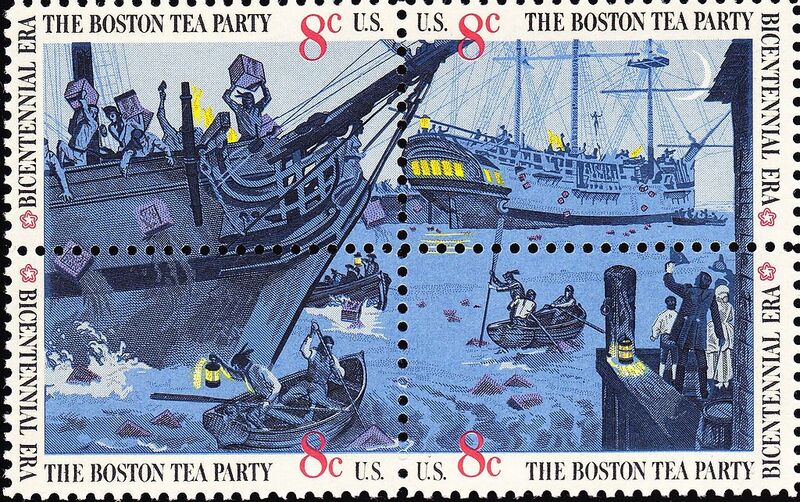 My venture consists of a short story, based on events surrounding the Boston Tea Party, which occurred in December of 1773. 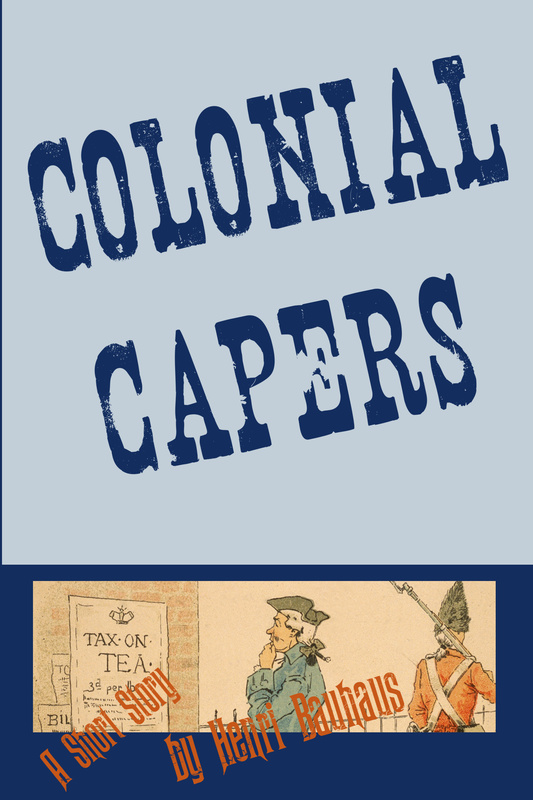 The tale is called Colonial Capers and is set before, during and after the famous action. The story is meant as a satire on the Colonial era and American history in general. Presently, it available through Smashwords. Here is the link. In a darkened boathouse on the edge of Boston Harbor, Phineas Phillips and a small band of dissidents sit quietly watching two British ships that are at anchor along the Pearl Street Wharf. Soon a band of heathen Indians will board the two schooners and toss all the tea into the harbor. With advance knowledge of what may happen, Phineas and friends have a different plan in mind. 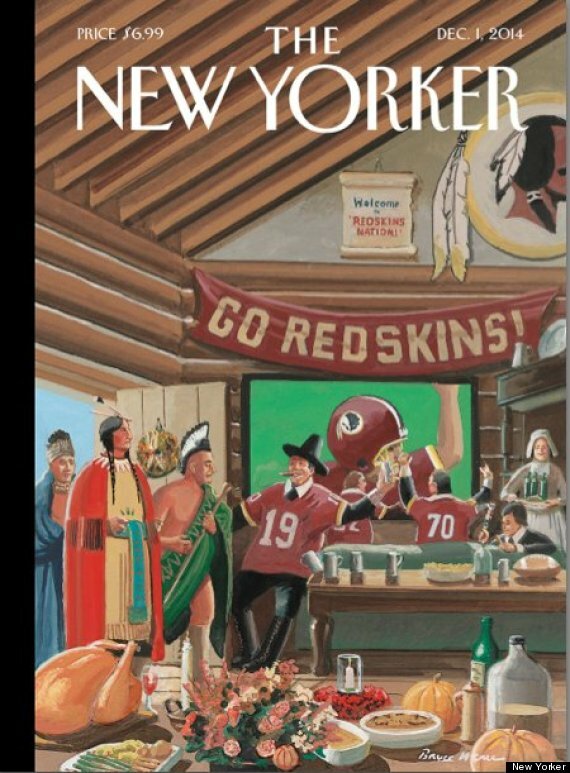 Redskins, Pumpkins, Pilgrims, Wild Turkeys and does anybody have a beer? To say that the pilgrims had a tough time of it in their early goings in the New World, might be a gross understatement. First, there was the oceanic crossing, which occurred in the autumn months, when the North Atlantic is at its stormiest. Although many were seasick for days on end, only two people perished during the tumultuous journey. But from here, things only got worst, as during the first winter at Plymouth, half of the 100 colonists died before the winter was out. Does Anybody Have a Beer? The first encounter with the Native population was even more surreal, as it occurred in the early spring after so many had died. In early March, an Indian by the name of Samoset, proudly walked into the Pilgrim settlement and promptly asked in understandable English, if anybody had any beer. To make things worst, Samoset and some of his Wampanoag friends had been living nearby for the course of the winter and so they must have been aware of the settlers severe decline. As it turned out, Samoset’s taste for alcohol and limited use of the English language came from his home on Monhegan Island, just off the coast of Maine. Here, English traders had been stopping by on this remote island for at least a decade and trading many items with the Natives for fresh supplies of food and water. A few unlucky souls had even been taken capture and transported across the Atlantic, where they were sold off as slaves. Squanto fell into this category, so maybe the New World wasn’t so new after all. In some ways the pilgrims were very lucky, for their new home occurred in a part of the America that had just been ravaged by small pox. Actually, this could have turned out really bad, if the local inhabitants had viewed the new arrivals as harbingers of the dreaded disease. But as it turned out, this was not the case. Instead, the English transplants were seen as suitable replacements, for the nearby village, which had been wiped out by smallpox. Not only did Samoset and his associates help the pilgrims survive, but also, the newcomers formed a mutual defense alliance with various Wampanoag villages that existed in what is now eastern Massachusetts. This became known as the Mayflower Pact and the agreement lasted, for as long as the Wampanoag sachem, Massasoit was alive. In fact, the Mayflower accord became a realistic model for the many treaties that were created between Indians and Whites in the following centuries. The main objection to using Redskin as a team mascot, in the NFL (or anywhere else), comes from its use as a term for a scalp, which is taken from an American Indian during warfare. Some scholars have pointed out the term originated among the American Indians to differentiate themselves from Whites and Blacks and so it is no more offensive than those terms. This may be true, but would anybody suggest changing the name of the Washington Redskins to the Washington Caucasians or the Washington Blacks. Today marks the 248th anniversary of the signing of the Declaration of Independence. Hooray for hot dogs and hamburgers grilled outdoors, but let’s not forget that the Revolutionary War dragged on for many years until Lord Cornwallis finally laid down his sword at the battle of Yorktown. Then there was the French Navy, who at the time of surrender, had blockcaded British ships from coming to the aid of their landlocked general. During this time period, the Revolutionary Army had very few victories. In fact, you might say that the deck was pretty well stacked against them. During the conflict, the fledgling new nation had many enemies besides the most obvious, the imperial motherland of Great Britain. How Popular Was the Revolt? 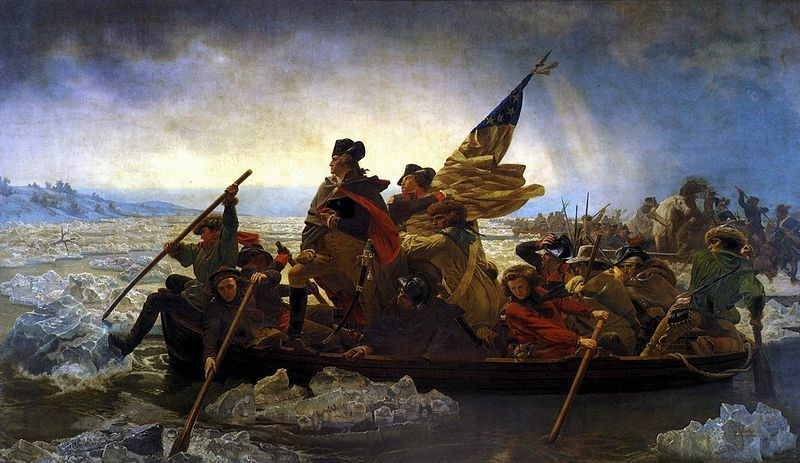 In the initial stages the effort of the Colonists to obtain independence from Great Britain was quite popular. This can be seen in events at Concord, Bunker Hill and the Boston Tea Party. However as the war dragged on the war effort lost appeal to many Colonists. On top of this there were a substantial number of New World residents, who saw many economic advantages in retaining close ties with England. After the war, many Loyalists, as the Tories were sometimes called, chose to relocate to other parts of the British Empire, such as Canada or the Caribbean. It is estimated that during the war, as much as 20% of the white population remained loyal to the crown. Still, the war effort would not have been successful without widespread support throughout the Colonial population. To complicate matters for the British, many European powers, including the French, Spanish and even the Dutch, ended up supporting the birth of a new nation on the shores of the New World. Here is a list of seven myths compiled from a Smithsonian article by John Ferling. Happy Fourth of July and enjoy those hamburgers, hot dogs and beers. On June 25th in the year of 1876 General Custer met his maker when he lead the Seventh Calvary on an attack of a large encampment of Sioux and Cheyenne. During the ensuing battle 268 U.S. Soldiers died in a short-lived conflict that only lasted a hour or so. The news of Custer’s humiliating defeat ripped through the Eastern US like a shock wave. The general public was in shock and awe as to how a whole command of soldiers could be eliminated in one battle that didn’t even take up a whole afternoon. In population centers, such as Washington, New York and Chicago, the general public was distraught at the outcome of the battle, for it was never realized that the US Army could possibly lose such a battle. The Plains Indians should have been rejoicing on their thrilling victory against one of the most foremost military commanders in the US military. They celebrated, but their were many among the Native population that could see the handwriting on the wall. The “Old Ways” were coming to the end and the future was not all that bright, especially for the colorful lifestyle that had evolved on the Great Plains for the Sioux, Cheyenne and other nomadic tribes of the region. Life on the reservation was becoming inevitable. Since the sixties tn has been popular to make fun of the General and famed Indian fighter. Johnny Cash accompanied by Buffy Saint Marie did a nice job on Cash’s variety hour, when they performed a singing number, entitled “The General Don’t Ride So Good Anymore.” But even more angst came with a book called “Custer Died For Your Sins”, written by Vine Deloria Jr. and of course the Hollywood classic, “Little Big Man”, where George Armstrong is humorously portrayed as a narcissistic warrior, obsessed with becoming president of the USA. This may be great entertainment…..but is it true. 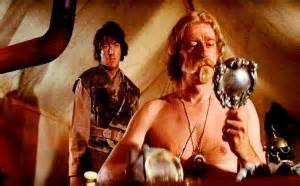 As a military man, General Custer was always a cunning and brave risktaker. On that fateful day in the grasslands of Wyoming, Custer may have been only doing what he had always done….and that is leading a small elite group of soldiers on a surprise raid against a strong enemy. His strategy had worked against the Confederates during the Civil War and it was also successful against the Cheyenne down in Oklahoma, but for some strange reason, this technique lead to disaster on the Little Bighorn. 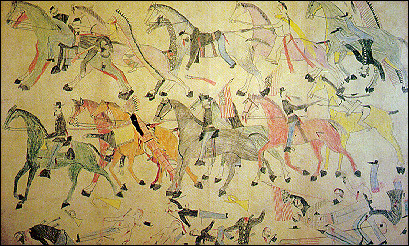 As one Lakota writer has suggested, the reason this attack failed was that a lone Sioux rider just happened across the advancing war party and was successfully able to warn the nearby encampment. Perhaps, it can be said that the fate of many an important battle has hinged on something so small as this. History is full of little ironies. Gobbler’s Knob in Punxsutawney, Pennsylvania is ground zero for Groundhog’s Day in America, for this is where the legendary Punxsutawney Phil makes his annual appearance and weather prediction for the next six weeks. According to Wikipedia, this strange conglomeration of Roman letters is used to express a Delaware Indian phrase, which can be translated to mean “town of the sandflies”. Situated south of Interstae 80, not too far from the town of State College, this small coal-mining, settlement of 6,000 people attracts a large crowd of visitors every February 2. The reason for this gathering is a groundhog named Punxsatawney Phil, who will faithfully reveal his prediction come rain or shine. This year 2013, Punxsatawney Phil did not see his shadow and so residents of western Pennsylvania are expecting an early end to winter. Groundhog Day in America is an unusual event to say the least, especially if you consider the inverse relationship of the weather on Feb. 2 and the actual arrival of warmer spring weather. However, like most holidays, Groundhog Day is not pure fiction, but actually has its origins across the Atlantic in western Europe. In many Christian countries, there is a mid-winter celebration called Candlemas, which just happens to occur at the mid point of winter, the second day of February. In fact, in Germany, legend states that it is the lowly hedgehog, which emerges from hibernation at mid-winter and either sees his shadow or he does not. It should also be noted that for many residents of northern Europe, having survived the first half of winter is definitely a time for celebration. The Christian church has capitalized on this popular holiday by encouraging parishioners to come to worship and light candles to mark the passing of the coldest season. Though now 20 years old, Groundhog Day, starring Bill Murray and Andie McDowell has become a cult classic among movie buffs. When it was first released, this film received good reviews, but over the last twenty years the movie seems to have gained popularity, often cited as one of the most popular comedies of all time. Strangely enough the notoriety of Punxsutawney Phil has followed a similar path.